This is usually carried out under a general anaesthetic and nerve block. It involves repairing the torn labrum arthroscopically (keyhole). The surgeon will discuss your individual surgery with you before the operation. 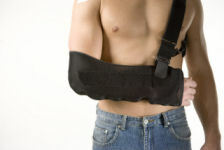 The operation involves reattachment of the torn labrum (see picture below). This usually done using sutures and small bone anchors. You will probably not be in hospital overnight after your operation, and should be able to go home about 4 hours after the surgery. A physiotherapist will see you in hospital to teach you the appropriate exercises. You will need physiotherapy after the surgery and should return to your own therapist. If you don't have one a local therapist can be found here. This keyhole operation is usually done through two or three 5mm puncture wounds. There will be no stitches only small sticking plaster strips over the wounds. These should be kept dry until healed. This usually takes 5 to 7 days. You may shower with waterproof plasters in the meantime. You may need to get these from a pharmacy if the hospital cannot provide them. For the first three weeks all activities of daily living for example feeding, dressing, cooking etc must be carried out using your un-operated arm. If appropriate an occupational therapist will be available to give you advice on how to do this. For more information Click Here. You will not be able to drive for a minimum of 4 weeks. Your surgeon will confirm when you may begin.